Washington, DC – The US Bureau of Labor Statistics recently released a new issue of The Economics Daily that looks at the prevalence of different types of work-related musculoskeletal disorders. Musculoskeletal disorders are injuries or illnesses that result from overexertion or repetitive motion. They include soft-tissue injuries such as sprains, strains, tears, hernias, and carpal tunnel syndrome. Work-related musculoskeletal disorders that result in days away from work most commonly involve the back alone. In 2016, musculoskeletal disorders involving the back accounted for 38.5 percent of all work-related musculoskeletal disorders (134,550 back cases out of 349,050 total cases). Nursing assistants experienced 10,330 back-related musculoskeletal disorder cases in 2016. Laborers and hand material movers experienced another 10,660 cases. These occupations accounted for 15.6 percent of all the back-related cases in 2016. 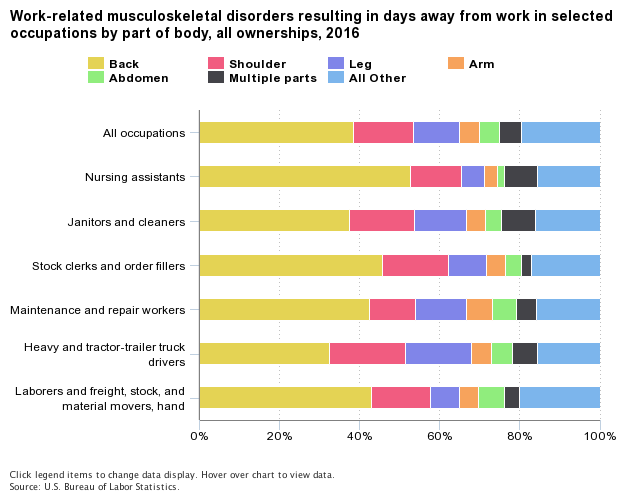 The most common body parts affected by musculoskeletal disorders vary by occupation. Among nursing assistants, more than half of their cases in 2016 affected the back. Compared with other occupations, heavy tractor-trailer truck drivers had a greater proportion of injuries that affected the shoulder (19.2 percent) and leg (16.3 percent). These data are from the Injuries, Illnesses, and Fatalities program. To learn more, see “Employer-Reported Workplace Injuries and Illnesses — 2016.” See BLS definitions for more information. Musculoskeletal disorders do not include impact events such as falls or struck by object.